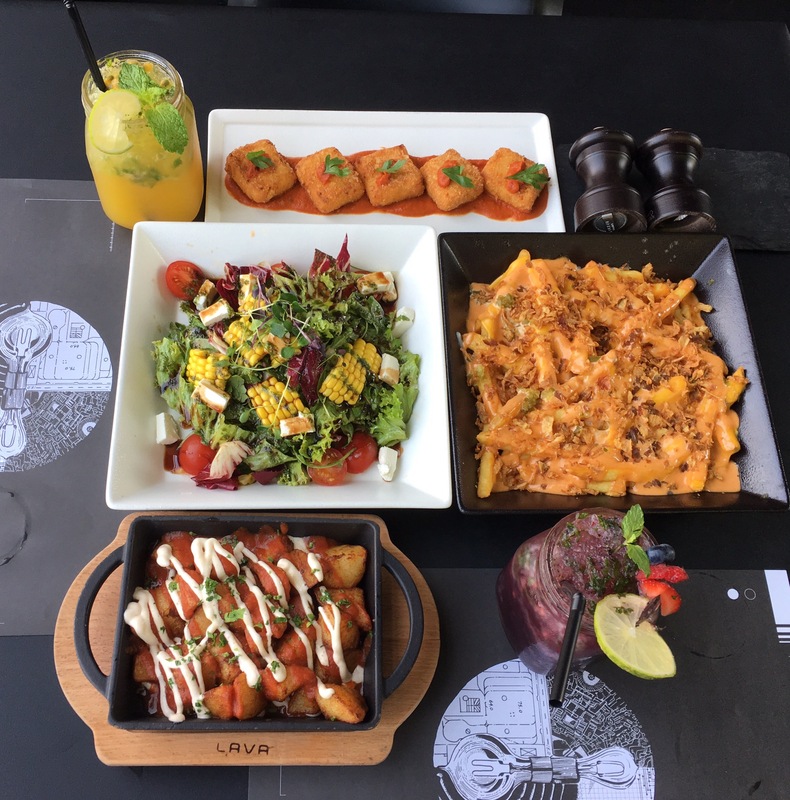 I had heard about Volt Kitchen’s hugely popular sister concept, Volt sometime ago and on one Saturday afternoon when I was scouting for a place in Jumeirah for lunch, I came across Volt Kitchen. That’s how I ended up dining at this place. 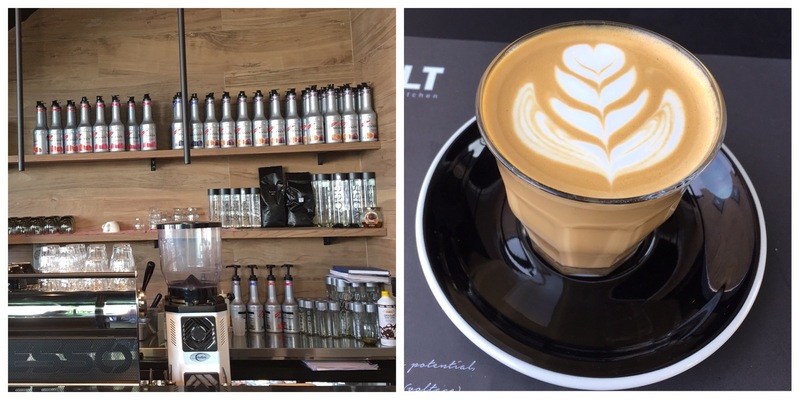 Volt Kitchen is the new restaurant/cafe by Volt Group of Restaurants. This trendy place is located in the beautiful district of Jumeirah. It is an international restaurant offering various kinds of dishes from different cuisines. 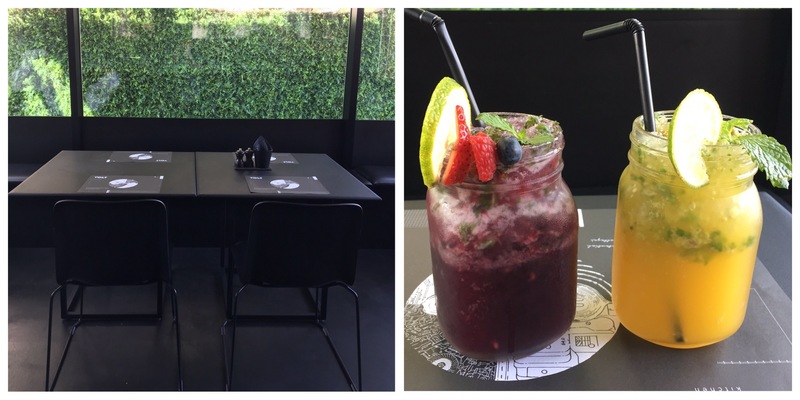 This home-grown concept is a black themed restaurant with funky and aesthetically appealing decor. In the daytime, the restaurant looked bright and cheerful. The latest radio hits in the background enhanced our dining experience. After being seated, we were given their iPad menu. The menu is simple and concise. It consisted of starters, salads, sliders, sushi, mains and desserts. Their drinks menu has a variety of mocktails and fresh juices. And they also serve specialty coffee. We ordered Mix Berry Mojito and Passion Fruit Mojito. Both the drinks were refreshing, cool and had a great flavor. Perfect way to cool off on a sunny afternoon. Feta Corn Salad was excellent, I can’t tell you how fresh, crunchy and tasty it was. This salad had a mix of sweet corn, feta cheese, wild rocket, baby spinach, red chard lettuce and cherry tomatoes drizzled with pomegranate sauce. Their Rainbow Fries is every French Fries lovers dream come true. It had crisp potato fries mixed with four kinds of cheese, that was served with their special house sauce. Potato Bravas made with crunchy Holland potatoes was another delicious starter that was slightly spicy and very yummy. Crispy Mac and Cheese bites were served with creamy tomato sauce. Mini Macs was another standout dish, we devoured it in couple of minutes. Sadly they don’t have veg sliders nor veg mains, but they do have veg sushi. 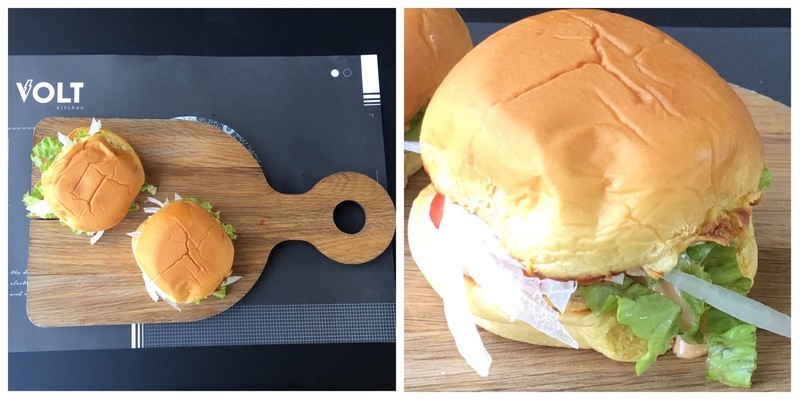 We were not in a mood for sushi, but we requested the staff to make us Sliders with just cheddar cheese, shredded lettuce, plum tomato, white onion with their special homemade sauce. Even that simple thing was pretty good, with an addition of patty, it would have been awesome. We liked their dessert selection, and we ordered their signature dessert- Chocolate Bomb. 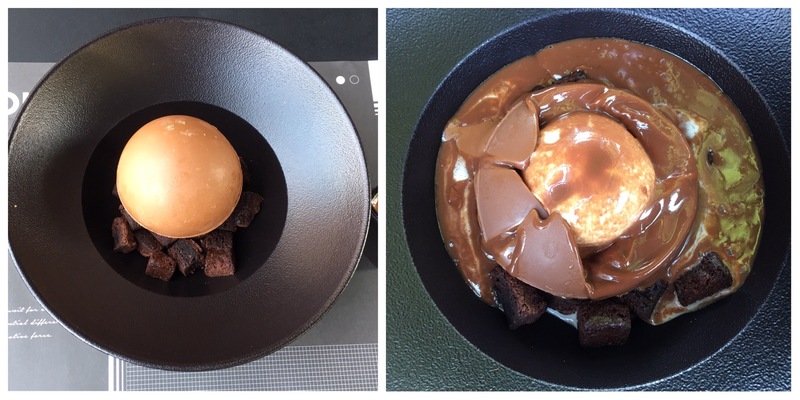 It had chocolate sphere filled with vanilla ice cream and was served with small bits of brownie and fudge. Hot chocolate sauce was poured over it. I don’t have words for this divine tasting dessert, felt like I went to chocolate heaven after eating it. We ended our lunch with their freshly brewed specialty Coffee. Liked the latte art whipped up by their barista. 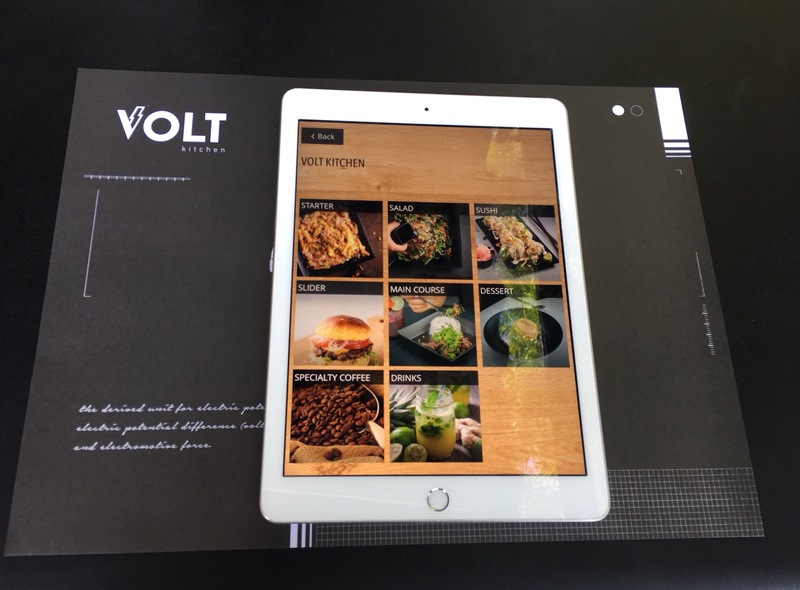 We went to Volt Kitchen without any expectations and came back as their fans. Loved the food, the drinks, the service and the atmosphere. My only request to them is to add a veggie slider and a veg main course dish. I’ll be going back again to try their newly launched breakfast menu.